The title is from lyrics by Sly and the family Stone, oom chakka chakka, oom, chaka chakka. What started out as an impressive pile of steel rubble on the ground has slowly risen to new and dizzying heights. 40 feet! 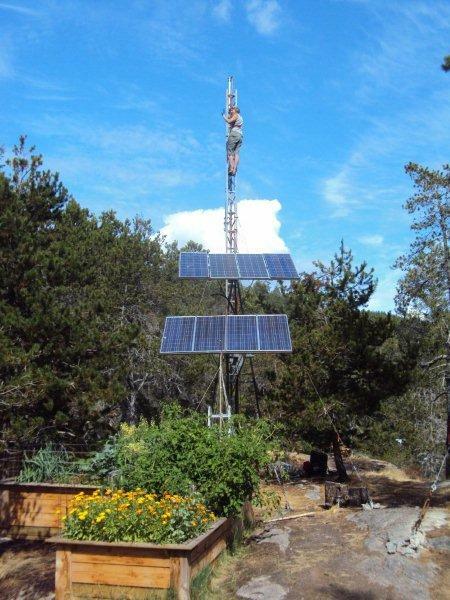 Yesterday, Sally scaled the then-existing 30 foot structure and attached another ten feet to our wind generator tower. It was not easy. The first 30 feet were relatively easy by comparison mostly because the tower was stayed by cables to the 20 foot mark only leaving the top ten feet swaying and that sway was minimal. Well, it was minimal until the gin pole was moved to the top again and another section of tower was being pulled up. Of course, Sally had to be at the top of the swaying thirty feet to be able to guide the next section in to place. Her previous intermittent knee knocking spread until she was suggesting that the vibrations were going to loosen the bolts already in place. So, she came down a few times to ‘compose herself’ and only ascended when it felt right. It rarely did and she was up and down like a yo-yo. I can’t say it was easy from my side, either, but it was a helluva lot less scary. Sally has cajones (figuratively speaking, of course). Lifting a 70 pound section of tower on a straight pull is not hard for me. In fact, I can pull twice that and only my hands feel strained. But, for some reason, this was getting harder and harder the higher I pulled. It was frustrating until it dawned on me – I was also pulling up about 50 pounds of pre-attached 5/16 steel cable that was dragging and catching on the ground around me. Attaching stays when the unit is up and in place is crazy dangerous so you attach them first on the ground and then pull the whole schamozzle up at once. So much easier. But that extra heavy pull strains the gin pole and our nerves. Everything vibrated including me. I was just as relieved for the chance to compose myself as Sally was. To raise a section of tower, one fastens the hoisting rope at just above the halfway mark on the section to be lifted. That means, on a ten foot length, the attachment is at the 5’6″ point leaving 4’6″ as the ‘top’ and 5’6″as the ‘bottom’. This allows the section to be raised vertically and oriented in the fashion needed to fix it in place at the top. But the damn stays/cables weighed so much that the top of the section kept flipping down and the piece was going up up-side down! We attached pulling lines and attachment hooks and all sorts of devices that would have helped keep it oriented had we had an extra arm or triple the strength. But they partially worked. We finally just raised it ‘upside-down’ and then flipped it at the last minute after having pulled the cables up just prior to the flip to take the weight off. It worked. Sal took forever putting the bolts in place but I knew why. Her hands were shaking. We now had 40 feet of tower up with Sally at the 30 foot level and everything above 20 feet was unstayed. That was 140 pounds of tower, 120 pounds of Sally and at least 50 pounds of cable all gently swaying a bit as she fastened the 12 bolts where the sections met. Usually whenever Sally is doing something along construction lines that she is not happy about, I crack jokes to help her out. They are rarely funny. They are not really intended to be. They are annoying and she gets mad and yells expletives at me. I laugh and she gets to vent her frustration and it helps her to relax. It is construction site therapy. She participates well as a rule. I have heard some dandies. Not this time. This time wasn’t merely just frustrating or difficult. It was past unpleasant and awkward. This time it was dangerous and scary. For both of us. I kept my stupid jokes to a minimum – one. The response I got from it told me that this was not the time for any more stupid jokes. So I shut up. We worked in silence until it was done and then made tea. Strangely the fifty foot section will be easier. If we choose to do it. The reason is simple: with the new stays supporting the tower at the forty foot level, the structure will be rock solid. There will no longer be the fear that swaying induces. But, of course, there are the ten extra feet one has to go up. So we’ll decide on that later. Right now, the ground never looked so good.